Happy First Day of Spring everyone! Are you ready to kick start your mojo with Julee's new sketch for the Mojo Monday Challenge? 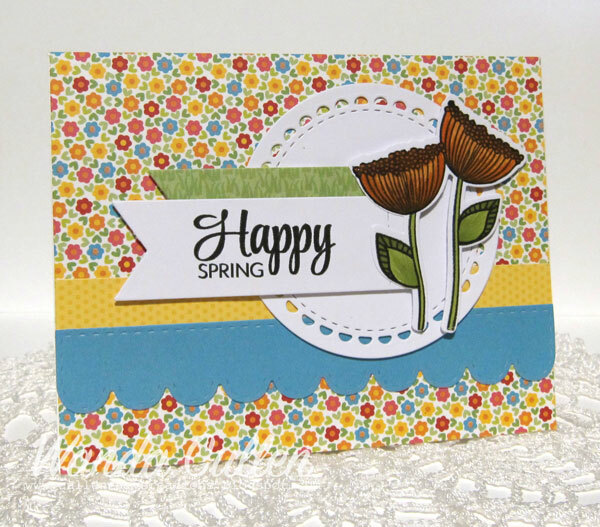 It's another great one and I met the challenge by creating a spring card with some happy colors! STAMPS: Happy Place and New Beginnings by Verve. PAPER: Sunkissed by Doodlebug Design; Lime Green by Reverse Confetti. DIES: Happy Doodles (Verve); Lacy Scallop Circles and Stitched Flag Trio (Reverse Confetti); Stitched Scallop Border (Lil' Inker Designs). Pretty and colorful. Love your card. Such a pretty card, Wanda. Love the shading on your flowers and those bright, sunny papers.